A compact module changing touch-trigger probe, which allows the use of a range of stylus configurations and extensions to access features on complex parts. 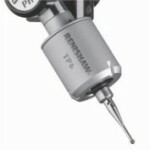 The TP20 is a compact 5-way, or 6-way, kinematic touch-trigger probe system. The two-piece design, comprising the probe body and detachable stylus module(s), are connected using a highly repeatable magnetic kinematic coupling. This provides the facility to change stylus configurations either manually or automatically without the need for re-qualification of the stylus tips, which gives significant time savings in inspection routines. The TP200 probe offers 6-way measuring capability, and uses micro strain gauge transducers to deliver excellent repeatability and accurate 3-D measurement even with long styli. The sensor technology gives sub-micron repeatability and eliminates the lobing characteristics encountered with kinematic probes. The solid state ASIC electronics within the probe ensure reliable operation over millions of trigger points. 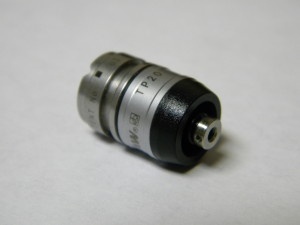 The TP200B uses the same technology as TP200 but has been designed to have higher tolerance to vibration. This helps to overcome the problem of ‘air’ trigger generation which can arise from vibrations transmitted through the CMM or when using long styli with faster positioning speeds. The TP6 and TP6A probes have different probe mount options (M8 thread and autojoint respectively). Both probes are kinematic touch-trigger probes and have manually adjustable trigger force for optimum probe performance with different stylus configurations. They can carry long styli (M3 range), are 25 mm (1 in) in diameter, providing substantial overtravel for excellent robustness. 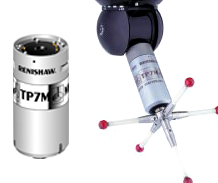 The TP7M is a 25 mm (1 in) diameter strain-gauge electronic touch probe with autojoint mounting, suited to high accuracy part measurement. This gives higher accuracy, eliminates lobing and reseat errors and offers a much longer life than kinematic touch-trigger probes. Incorporating a multi-wired autojoint connection, the TP7M is compatible with the PH10M PLUS / PH10MQ PLUS motorised heads, PH6M fixed probe head, plus the range of multi-wired extension bars (PEM).